Get your spot in the SHAZAM Red Thread Circle now – and if you cannot join us live you can get the recording within 24 hours. Share this with women in your life so that you can DARE together! 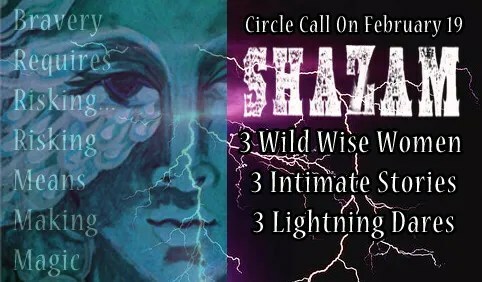 Join 3 wild wise women for a circle designed to bring LIGHTNING to your own story. With the magic word of SHAZAM! this conversation will be playful and powerful and give you an intimate look into the lives of 3 creatives, Catt Geller, Mary MacDonald, and Shiloh Sophia – all who came out of the corporate world and who now find themselves authoring their own lives as writers, painters, poets and guides for other women in the Intentional Creativity Movement. You will hear each of their stories, intimate versions. And how they made it out of the other world and into the world they live in now. The corporate world was far more dangerous to the life of their soul, but this one is by far the most dangerous territory because the life of women visionaries is fraught with fear, doubt, anger, confusion and joy, possibility, light and transformation on a daily basis. need encouragement to take action, and some of us need LIGHT-NING. We will also look at each of your stories and where they are now – and where you long to bring your stories of your future. Bring a cup of tea and your magic necklace or beads that you want to have ‘charged up’ during the call. This isn’t just a call, it is a circle – of women. When over women gather we create field of resonance in which things are possible that were not possible before. Risking means making magic, together.